Who could resist this lovely trio of buttery, crumble shortbread, smooth, creamy caramel and decadent, rich milk chocolate? It looks and tastes like a million buckaroos! You’re smack dab in the middle of the royal court with William and Kate +1. Life is good, right? (Aren’t they just the cutest family?) My mom, my sisters and I are obsessed with the royal family and have been over the years! Princess Di and her boys specifically. NOM, NOM, NOM! 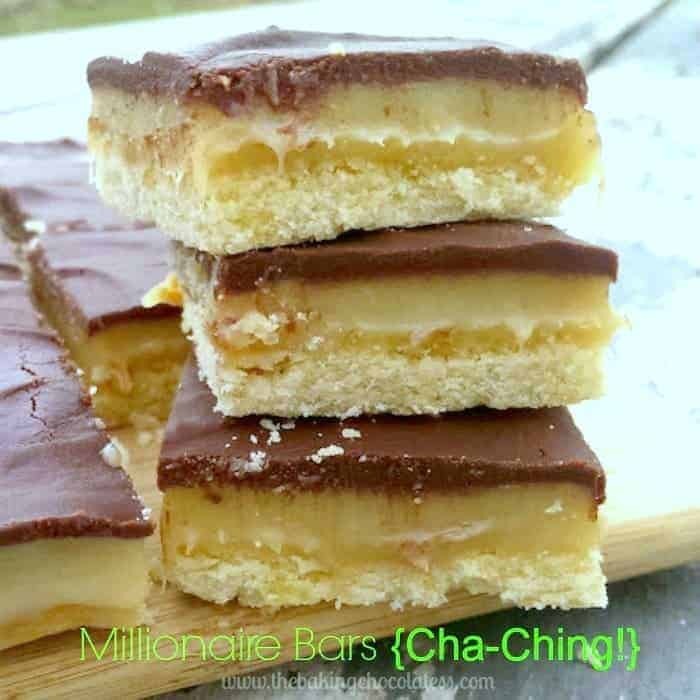 I’m also totally obsessing over these Millionaire Bars! It’s kind of funny, whenever I think of shortbread, I think of those Pecan Sandies from Keebler. My mom would buy them, and I would hoard them and gobble them up with a large glass of cold milk, dunking away. It’s called ‘growing pains’! May it please Your Majesties, here’s a real sweet millionaire’s treat! Now take a bow and enjoy! Who could resist this trio of buttery, crumble shortbread, smooth, creamy caramel and decadent, rich milk chocolate? Life is good, right? Preheat the oven to 350 degrees. Line a 9-inch square pan with aluminum foil and spray with nonstick cooking spray. In a medium bowl, whisk the flour, cornstarch and salt together. In a large bowl, beat the sugar & butter together until well incorporated and mixture is slightly fluffy. Add the dry ingredients slowly to the butter & sugar mixture, and mix it together until well combined. Put the dough into the prepared pan and press with your fingers into an even layer (dust your fingers with flour if the dough is too sticky). With a fork, pierce the dough all over. Bake until golden, about 15 - 20 minutes. 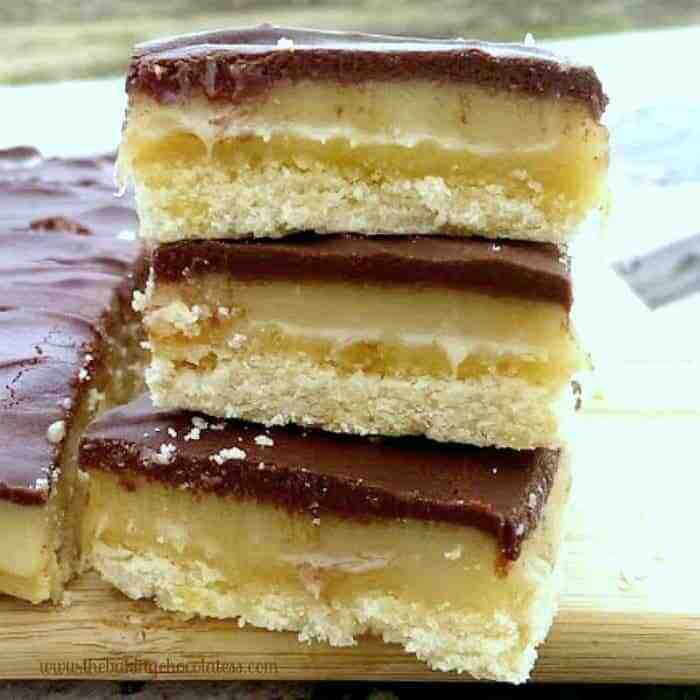 Set aside to cool.Transfer the pan to a wire rack and cool completely before adding the caramel layer. Over medium heat, whisk the sweetened condensed milk, brown sugar, butter, maple syrup, vanilla and salt together in a medium saucepan. Stir occasionally until the butter is melted. Increase the heat to medium-high, & bring the mixture to a boil. After it is brought to a boil, reduce the heat to a simmer, whisking constantly, until the mixture thickens and turns a light caramel color, approximately 6 -10 minutes (candy thermometer temperature 225 degrees F). The longer you cook the caramel will depend on the consistency you want your caramel to be. Pour the caramel mixture over the cooled shortbread and spread it evenly. 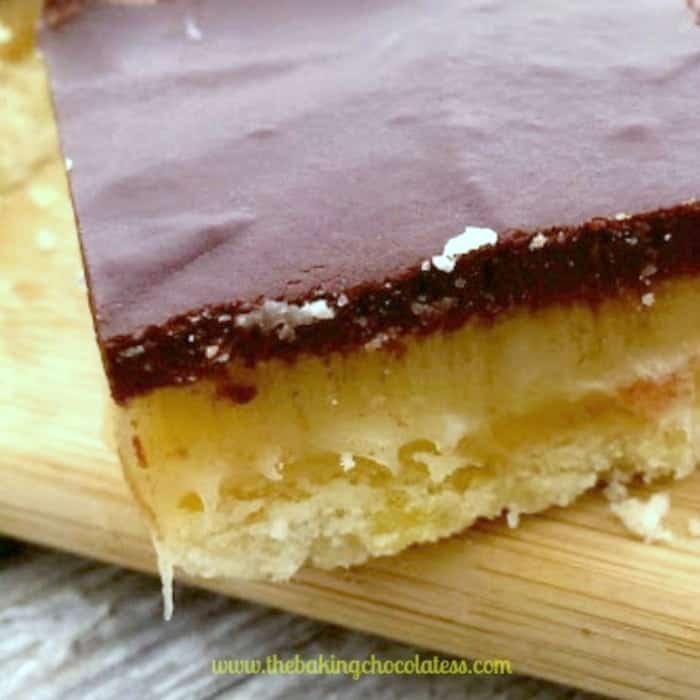 Wait for it to cool down completely, then allow to chill for a little while, because if the caramel layer isn’t solid enough, it will mix in with the chocolate. Place the chocolate and cream in a microwave-safe bowl. Microwave in 20 second intervals, stirring in between, until the chocolate is almost melted. Stir, allowing the heat in the bowl to melt the remaining chocolate, until smooth. Pour the chocolate over the chilled caramel and spread evenly and smooth it out. Let the chocolate set completely before cutting your bars. If you want to use a different chocolate flavor, go for it! Whatever tickles your fancy! 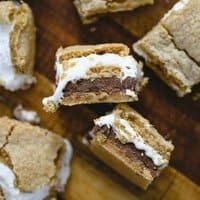 Looking for other shortbread recipes for the holidays? Here’s a couple! 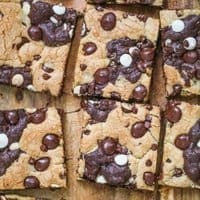 Peanut Butter Milk Chocolate Chip Shortbread Cookies! 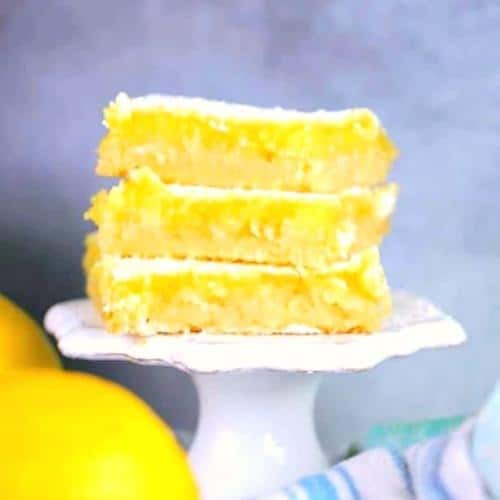 Oh boy, these look delicious!! Thanks for linking up to Found & Foraged!! Thanks Laura! 🙂 Lots of great creations over there! Thank you Grace! I will definitely be back! Thanks for hosting! Thank you so much for linking up at Found & Foraged! PINNED! Hope to see you again this Saturday night at 8PM! Hi Kyla! Planning on it for sure and looking forward to it! Thank you 🙂 Have a great weekend!